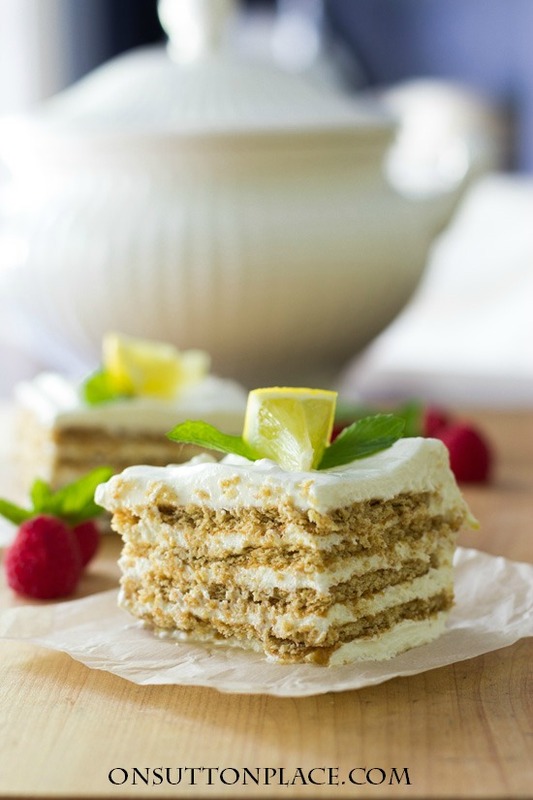 Just 5 ingredients in this amazing Lemonade Icebox Cake Recipe! So easy to put together and there’s no baking. Lasts in the refrigerator for several days! Summer and lemonade are like Bert and Ernie or peanut butter and jelly. Chips and dip…Lucy and Ricky. 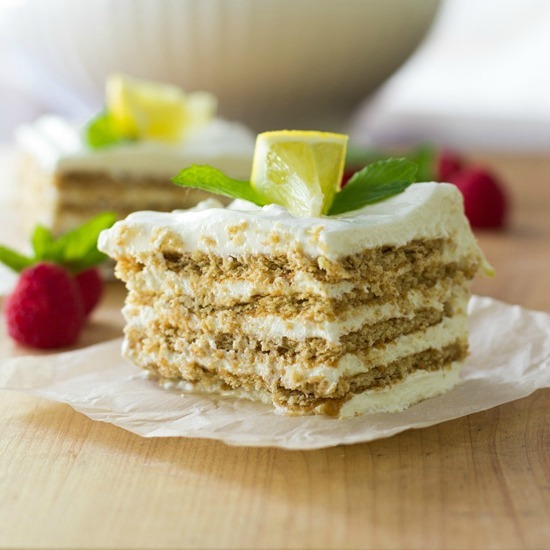 They just go together…so when I found this Lemonade Icebox Cake recipe I knew it was a great choice for an easy summer dessert. Emphasis on easy. The hardest part is waiting the six hours it takes for the cake to set up! 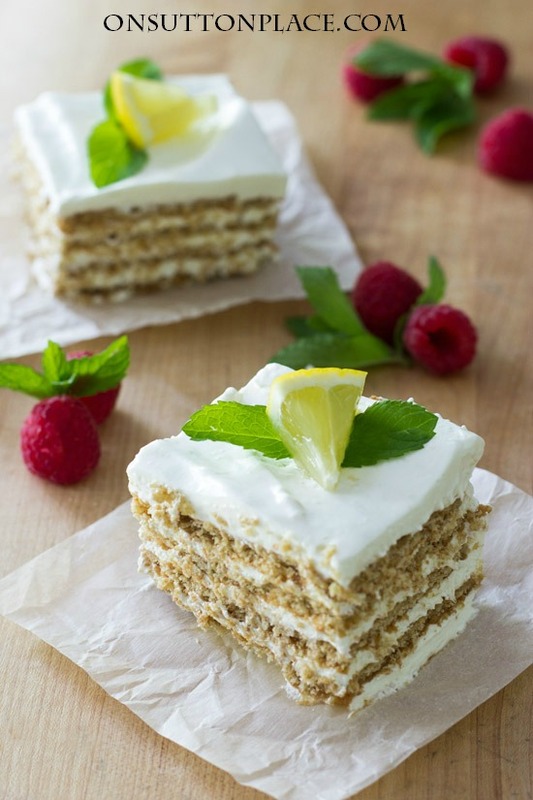 Just 5 ingredients in this amazing Lemonade Icebox Cake Recipe! So easy to put together and there's no baking. Lasts in the refrigerator for several days! Beat cream cheese and milk until smooth. About 2 minutes. Add thawed lemonade and lemon zest. Beat again another minute until well blended. In an 8 x 8 glass dish, spread a thin layer of the Cool Whip mixture. Place graham crackers (covering the whole layer) and press lightly so they sink into the Cool Whip. Make three more layers. You should end and begin with the Cool Whip mixture and have four layers of graham crackers. I used Cool Whip Lite and it worked great. This lasts in the refrigerator 3 or 4 days. Just cover lightly with foil. A couple more things about this cake that I just love. First, it lasts for days in the refrigerator. You can definitely make it a day or two ahead if you are serving it for an event. Second, it cuts like a real cake and it looks beautiful. A simple lemon and mint garnish is all you need to impress the pants off your guests! Visit my Amazon Shop for my favorite kitchen tools…and much more! Click HERE to join the OSP email subscriber list! I have a question about one ingredient in the lemonade icebox cake. Is “frozen lemonade thawed” supposed to be lemonade concentrate? If not, then 3/4 cup of lemonade can be used, right? Yes. Use frozen lemonade concentrate that has been thawed. I will clarify that in the recipe. Thank you! This recipe is delicious. I served it when a couple of my girlfriends came for our “almost” monthly time together. They were impressed and wanted the recipe. I referred them to your site as well as shared the recipe and one of them is now following you. Thank you for sharing your ideas. You create such a warm and caring atmosphere in your blog. I made this recipe but changed it to a strawberry ice box cake. I substituted a package of frozen sweetened berries for the Lemonade and omitted the lemon zest. I also used vanilla wafers instead of graham crackers. It was delicious. Ann, can this be frozen? I think using whip cream you could. That would be great. I like having things in my freezer, all ready. I just made this and it is in the refrigerator. I cannot wait to eat it. I just licked and licked the bowl of the mixture and I know this one is going to be a winner. It will be perfect for a warm summer evening, like tonight. This sounds wonderful, light and just the right flavors for summer. I have never tried an icebox cake, but think I will try one soon! I would love it if you would stop by and share this at my new link party at Celebrate and Decorate! 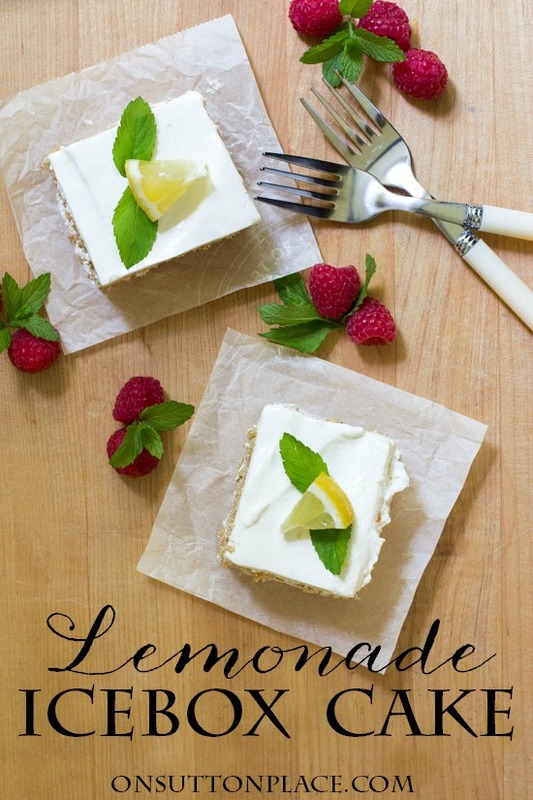 Where is the recipe for this Lemonade Icebox cake ? I signed up saw the listing but all I see is a picture of the cake and where you talk a little bit about it, but where is the recipe itself ?? Looks soooo refreshing!!! How would I double this for a big crowd?? Can’t wait to try this dessert! hit and every piece was gone………….even folks that aren’t crazy about lemon flavored desserts LOVED it! Thank you for a great recipe!!! Sooo good! Made it last night and served it this afternoon! I think I am going to make it again for a 4th of July party, but will double the recipe! i just made this and I am not sure I can wait until after dinner tonight. It was super easy and smells so fresh and yummy. Thanks for sharing! Oh dang. I know what I’ll be making when we have people over for a BBQ next weekend. This looks amazing! PS: your food styling/photography is amazing. I haven’t had an icebox cake since I was a kid. Reading your Blog on the Lemonade Icebox cake inspired me to make it. A perfect dessert for our Central Florida Summertime. It was so easy and is delicious! I love your Blog! I’ve made so many beautiful gifts from your ideas (sewing and baking). Thank You for continuing to remind me the simple things bring such joy to those you love. I’m so happy you enjoyed the cake…thank you for taking the time to say hi! I’m allergic to coconut and palm oils both in cool whip can real whip cream be used instead? I’d really like to try this recipe. Hi Bernardette…yes you could probably use whipping cream but it might not hold up in the refrig. If you were planning to eat the cake in a day or so I think it would work great. Good luck! I cannot wait to make this. Thank you for sharing. :-) Have a wonderful day!! Jack would die for this! I am going to have to make it for him when we get back from vacation! Can’t wait to try the lemonade cake recipe. Your porch is delightful!! My bHome user name is slmartin52. Lemon is so refreshing! And since the heat index is 101 degrees in my hometown in Florida, this week would be a great time to make this cake. Thank you so much for this recipe.